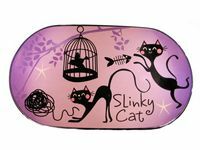 The Slinky Cat Square Platter measures 27cm x 27cm. Predominately orange in colour with cat design in black. 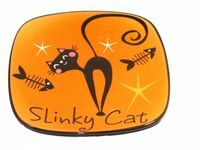 The Slinky Cat Small Square Plate measures 14cm x 14cm. The Slinky Cat Sandwich Platter measures 27cm x 15.5cm. Predominately mauve in colour with cat design in black. Price quoted is for 1 Slinky Cat Sandwich Platter. The creamer is approximately 8.5cm high,has a base of 10cm wide and top is 10cm wide. Predominately lime green in colour with cat design in black. The set weighs approximately 791g. 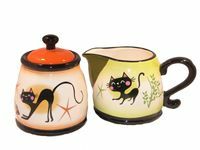 Price quoted is for A Slinky Cat Sugar Bowl and a Slinky Cat Creamer. Also available is matching teapot and teacup and saucer set. 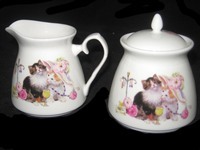 Price quoted is for 1 Cats and Hat Sugar and Creamer Set.